I’ll continue my New Year’s fireworks with another little-known mixture of 2 vibrant cultures you won’t hear about in many classrooms. 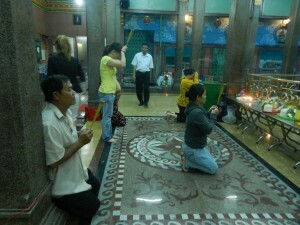 I didn’t know much about it either before I entered Ho Chi Minh City’s main Hindu temple. 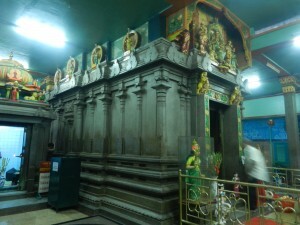 The shrine’s in the thick of the main business and retail area, and it’s dedicated to a goddess who’s widely venerated in southern India called Mariamman. 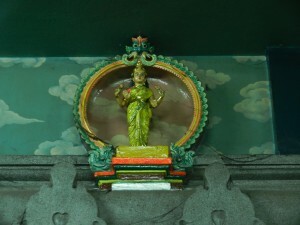 In her homeland she’s represented the rains and the earth’s fertility. In sprawling business-minded and pleasure-loving Ho Chi Minh City, she bestows general prosperity and health. A very good neighbor for the shop owners. 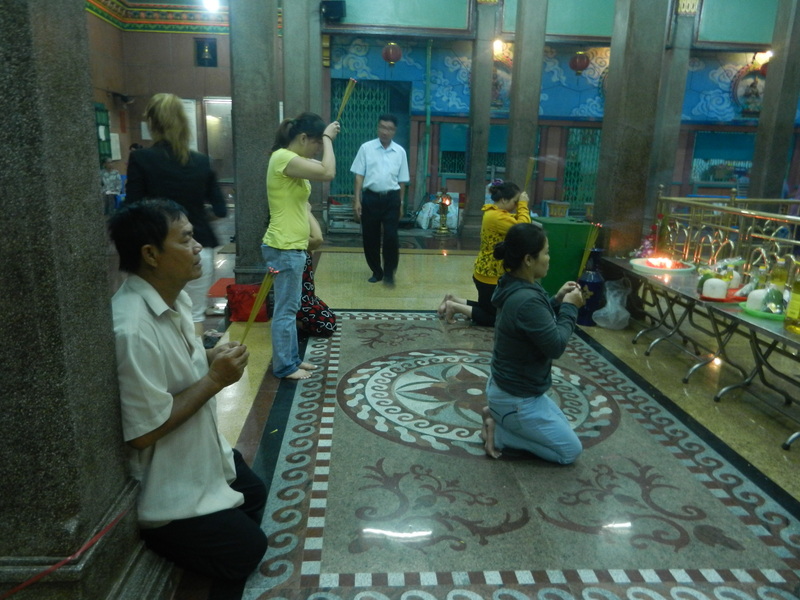 A sign said that the temple’s considered very powerful and that Vietnamese and ethnically Chinese people thus worship there too. I guess so–I never noticed any Indians though the shrine always had many visitors. 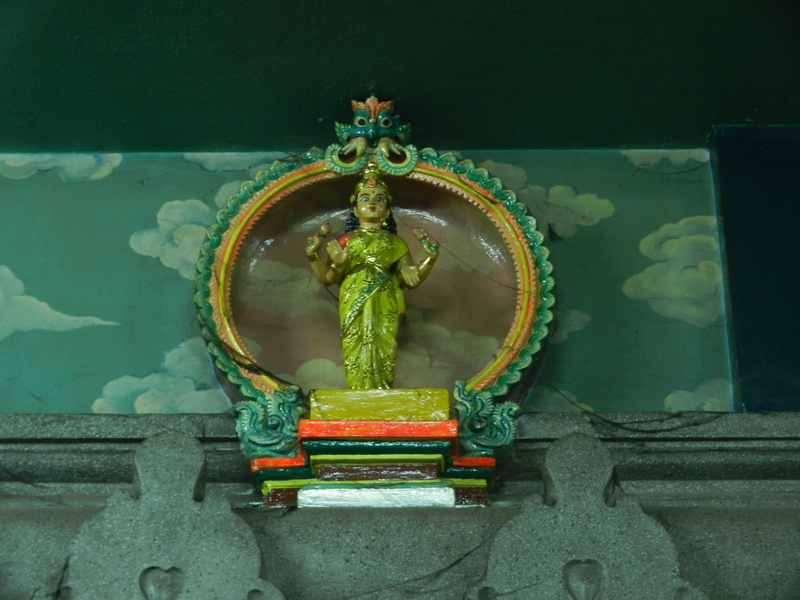 Ancient Indians developed a rich conceptual framework around Mariamman. She was closely associated with Parvati (Shiva’s consort and the mother of all goddesses), and often seen as an emanation of her. People thus imagined her as the mother of two popular gods born to Shiva and Parati. You can see them in the first picture. Ganesh is to her right, and he’s an elephant-headed deity who often grants wealth–many businesspeople honor him. 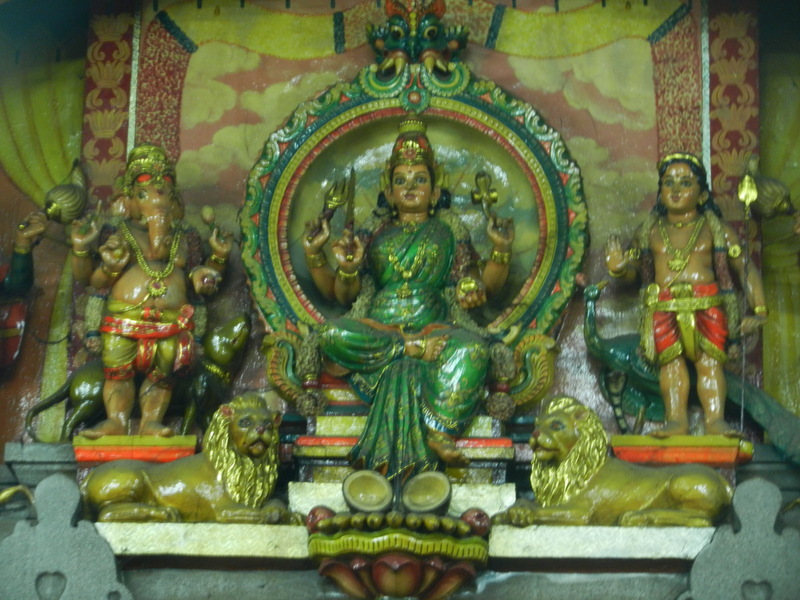 Murugan is the more masculine one on her left. Many southern Indians have seen him as a demon-fighting hero, but more esoteric thought sees him as a representative of the will power to overcome the ego. 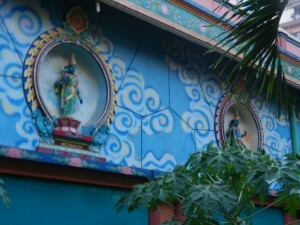 several statues line the top of the shrine, and they’re surrounded by Chinese-influenced cloud patterns. The walls which enclose the whole temple also have these statues surrounded by animated clouds. Each statue is a different incarnation of Mariamman, so as I walked around the central shrine, her different forms filled the place with her energy. The clouds expressed her gentleness, and her ancient associations with rain. Mariamman temples preside in many other Southeast Asian cities. Each place blends cultural patterns that have intersected in Southeast Asia for more than 2,000 years, which make this one of the world’s most fascinating regions. 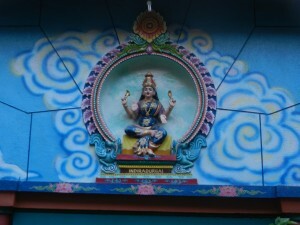 I haven’t yet become rich, but Mariamman’s temple bestowed enough cultural wealth to satisfy me anyway.